Thioridazine Overdose is the accidental or intentional intake of the drug in dosage higher than prescribed values. What are the Causes of Thioridazine Overdose? What are the Signs and Symptoms of Thioridazine Overdose? The signs and symptoms of Thioridazine Overdose can vary from one individual to another. It may be mild in some and severe in others. Several systems of the body, such as the digestive system, nervous system, vascular system, urinary system, skin and ENT may be affected. How is First Aid administered for Thioridazine Overdose? Who should administer First Aid for Thioridazine Overdose? 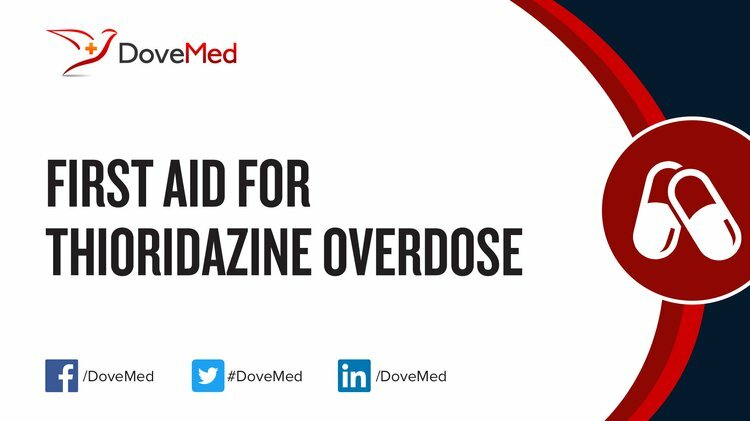 First aid for Thioridazine Overdose is administered by healthcare professionals. What is the Prognosis of Thioridazine Overdose? How can Thioridazine Overdose be Prevented? Isbister, G. K., Balit, C. R., Macleod, D., & Duffull, S. B. (2010). Amisulpride overdose is frequently associated with QT prolongation and torsades de pointes. Journal of clinical psychopharmacology, 30(4), 391-395. Berling, I., & Isbister, G. K. (2015). Prolonged QT risk assessment in antipsychotic overdose using the QT nomogram. Annals of emergency medicine, 66(2), 154-164. Ke, X. Y., Ng, V. W. L., Gao, S. J., Tong, Y. W., Hedrick, J. L., & Yang, Y. Y. (2014). Co-delivery of thioridazine and doxorubicin using polymeric micelles for targeting both cancer cells and cancer stem cells. Biomaterials, 35(3), 1096-1108. Waring, W. S., & McGettigan, P. (2011). Clinical toxicology and drug regulation: a United Kingdom perspective. Clinical Toxicology, 49(6), 452-456. Shimizu, W. (2013). Acquired form of Brugada syndrome. In Electrical Diseases of the Heart (pp. 123-137). Springer London. Berling, I., Buckley, N. A., & Isbister, G. K. (2016). The antipsychotic story: changes in prescriptions and overdose without better safety. British journal of clinical pharmacology, 82(1), 249-254.